Climate change is amplified in the Arctic region relative to the global mean. Arctic amplification has been found in past warm and glacial climates, as well as in historical simulations. The phenomenon is often explained by retreating snow and ice leading to more solar surface warming (surface albedo feedback). In this contribution, Dr. Felix Pithan and Dr. Thorsten Mauritsen at Max Planck Institute for Meteorology, department "The Atmosphere in the Earth System", analyse results obtained from the CMIP5 archive quantifying the relative contributions to Arctic and tropical temperature change showing that contrasts in temperature feedbacks dominate over surface albedo feedback in models. This is due both to a bottom-heavy vertical structure of warming and generally lower temperatures in the Arctic. It is widely established that additional solar absorption at the surface due to melting snow and ice in a warming climate represents a positive feedback mechanism predominantly active at higher latitudes. Several recent studies tout this mechanism as the main cause of Arctic amplification, although doubt has been cast by model studies with disabled surface albedo feedback and by a finding that longwave feedbacks collectively outweigh shortwave feedbacks in contributing to amplification in models. Alternative suggestions include water vapour, cloud and lapse rate feedbacks, as well as atmospheric and oceanic energy transport increases from lower latitudes. The impact of rising temperatures on the outgoing longwave radiation to space is the main negative feedback that allows the climate system to stabilize at a certain temperature under given conditions. It is useful to decompose this feedback into the Planck feedback, which is that of a uniformly warming troposphere at the rate of surface warming, and the lapse rate feedback, which represents the deviations from vertically uniform warming. Fig. 1: Arctic (>60N) versus tropical (30S-30N) warming contributions from individual feedback mechanisms, CO2 forcing, atmospheric meridional energy transport and ocean heat uptake and meridional transport (ocean). Gray is the residual error. Each dot represents the CMIP5 model ensemble mean. Models used are listed in Figure 2. Modified from Pithan and Mauritsen (2014). In the tropics, deep convective clouds efficiently mix the troposphere such as to maintain temperatures close to that of a moist adiabat, meaning that during warming the upper troposphere warms more than the surface. This constitutes a negative lapse-rate feedback as the system can radiate more effectively to space. In the Arctic no such effective mixing processes occur and warming tends to be stronger at the surface and in the lower part of the troposphere, yielding there a regionally positive lapse-rate feedback. Thus it is to be expected that lapse-rate feedback contributes to Arctic amplification. Fig. 2: Inter-model spread of Arctic warming contributions of feedbacks versus total Arctic warming in individual models. Lines are linear regressions of feedback contributions against total Arctic warming. Filled circles on the black vertical line represent the ensemble mean. The right-hand side shows the spread of Arctic warming contributions in the analysed models. Circles show the median, inner line ends 25th and 75th percentiles, and line ends show the full ensemble spread. Modified from Pithan and Mauritsen (2014). Perhaps less often recognized, the Planck feedback will further contribute to Arctic amplification because of the temperature-dependency of black-body radiation. In fact, irradiance is nearly twice as high at +30°C than at -30°C, meaning that warming would have to be greater during Arctic winter as compared to the tropic to balance a certain flux change. 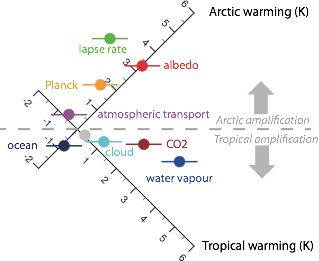 To investigate the role of feedback mechanisms Pithan and Maritsen employ an inverted radiative kernel methodology and devise a linear decomposition of the individual contributions to tropical and Arctic warming (Fig. 1). They find that on average lapse rate and surface albedo feedback contribute the same amount to Arctic warming, but since lapse rate feedback cools the tropics it is the main contributor to Arctic amplification. Also Planck feedback makes a sizeable contribution to Arctic amplification, such that together these two temperature feedbacks dominate the response. Even though all models exhibit Arctic amplification, there exists a considerable inter-model spread. To investigate this the authors rank models according to their total Arctic warming and plot the individual contribution terms (Fig. 2). It is found that surface albedo feedback dominates spread that projects onto total Arctic warming (regression lines), followed by lapse-rate, cloud, Planck and water vapour feedbacks. Interestingly, atmospheric transport acts to dampen inter-model spread with positive contributions in weakly warming models and reduced transport for strongly warming models. A quantitative understanding of the physical mechanisms that drive Arctic amplification of climate change underpins the confidence in and ability to constrain model projections of future Arctic change, including sea ice melt, and permits a focus of research on the most important processes. Contrary to a widespread assumption, temperature feedbacks dominate Arctic amplification in models, whereas surface albedo feedback is of considerable, yet, secondary importance. Pithan, F. and T. Mauritsen (2014): Arctic amplification dominated by temperature feedbacks in contemporary climate models, Nature Geoscience, 7, 181-184.